LAUREL, N.J., Nov. 15, 2018 – Attendees of all ages enjoyed live musical entertainment and authentic Korean culinary delights at Laurel Brook Rehabilitation & Healthcare Center’s recent Korean Community open house. 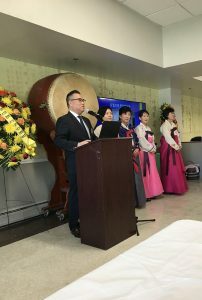 Pastor John Sung (pictured at podium), director of the facility’s Korean Community programming, addressed attendees at the event, which was held in celebration of recent renovations to the skilled nursing facility’s dedicated cultural wing. Located at 3718 Church Road in Mt. Laurel, Laurel Brook, a Marquis Health Services member, provides post-hospital care, short-term rehab, memory care, long-term and respite care. Within Laurel Brook’s popular Korean Community wing, Korean seniors benefit from high-quality skilled nursing care in a cultural setting. With the support of caregivers and medical professionals who share their values and speak their language, residents enjoy familiar traditional décor, ethnic cuisine prepared in-house, and special cultural programming and recreational activities.